Starting Monday, contractors will make emergency nighttime repairs to the William F. Cribari Bridge over the Saugatuck River. That means closures and detours, from 8 p.m. until 5 a.m. Mondays through Thursdays. The tentative schedule calls for 6 weeks of work — weather permitting. That’s bad news for commuters. And for businesses that depend on bridge traffic for customers: restaurants, bars and Saugatuck Sweets, for example. 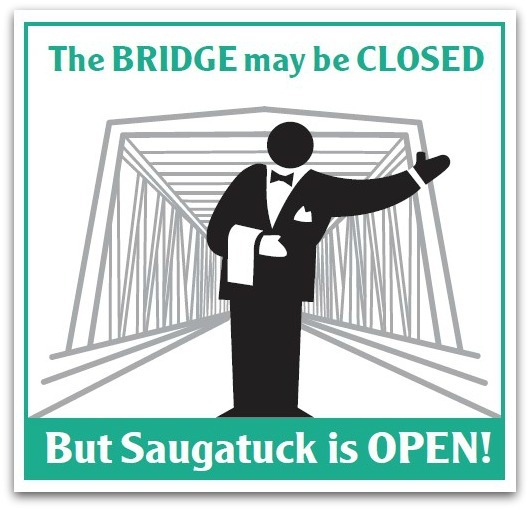 So the Westport Weston Chamber of Commerce is spreading the word: “The Bridge May be Closed, But Saugatuck is Open!” Miggs Burroughs has donated artwork to help folks realize that despite detours, you can still eat, drink and enjoy all the places that make Saugatuck fun. Speaking of Saugatuck and the Chamber: The next “Tuesday @ the Train” event is this coming week (August 6, 5:30 to 8:30 p.m.). Luciano Park is the spot for music, food, beer, wine and games. All commuters, their families, even the many Westporters who work at home and need a break are welcome! And speaking of construction that impacts local businesses: I haven’t heard a peep of protest from the shops in Sconset Square. But they must be impacted hugely by the long-running Aquarion project that’s tearing up — and often closing — Myrtle Avenue. So here’s another reminder: Sconset Square is not closed. Just park on the Post Road, Church Lane, or anywhere else downtown, and walk over for Le Penguin, Bungalow, Bespoke Designs, and all the other places at this popular, but now hard-to-park-at, shopping center. There’s more than one way to get to Sconset Square. This view is from Church Lane. This entry was posted in Downtown, Local business, Organizations, Restaurants, Saugatuck and tagged Westport-Weston Chamber of Commerce. Bookmark the permalink. The construction crews on Myrtle Avenue have been very good about still allowing people to park in Sconset Square. What about the humans who live on Myrtle? I could write a pretty good short story about the death and destruction since May. This week alone featured a damaged 24,000 strand communications cable and the new water main floating in raw sewage from a shattered sewer lateral. Of course, I know now that this is all part of what happens when you start digging in a road that’s filled to the gills with below ground utilities. And it’s no criticism of the contractor’s crew who are the nicest people you will ever meet. I just hope that town officials take to heart the personal impact a water main replacement project can have on residents, not least because Aquarion has announced that it intends to replace TEN more water mains in Westport. When the dust has settled, I would encourage the RTM Public Works Committee to hold a hearing to consider lessons learned. Otherwise, it’s possible many more residents will likely be needlessly harmed in the future. Morley, any details available on the ten water mains that will be replaced? Sorry John, all I can maybe add it that I think the proposed Westport water main replacement project is supposed to possibly phase in over the next five years. Aquarion officials casually mentioned the ten water main detail at that July 12th PURA meeting regarding the North Avenue water tanks. Residents in the audience who, based on personal experience, knew that a water main replacement can include noise, dust, dirt, vibration, epic traffic, road closures, driveway closures, water service suspensions, gross plastic temporary water service lines everywhere, property damage, broken sewer lines, broken gas lines, broken communication lines, poor communication, conflicting communication, no communication, erroneous water bills, etc. quietly freaked.